Are we experiencing God in the ordinary events of our daily lives? How ordinary! The Son of God is born of Mary and entrusted to Joseph and her. With the exception of a few humble shepherds and the Magi, people gave them little notice. Joseph and Mary were practicing Jews who observed the laws and traditions of Judaism. Jesus was circumcised on the eighth day and consecrated to God in the Temple in Jerusalem as was required for first born males of Jewish families. The Gospels give us few facts about Jesus’ childhood other than the incident when he was 12 and stayed behind in the temple during the family’s annual pilgrimage to Jerusalem. The likelihood is that Jesus’ early life was very ordinary with Jesus growing up as a young Jewish boy, experiencing all of the things any Jewish boy would have experienced with family and neighbors. They would observe family traditions and the practice of Judaism in a small village. Jesus likely learned his father’s trade of being a carpenter, and was probably a carpenter himself during his early adult years. God inhabits the ordinary. He did this with Jesus. He inhabited the ordinary in preparation for the extraordinary. He did this with the prophets that went before Jesus. He does this with us. We cannot expect to experience God in the extraordinary if we are not experiencing him in the ordinary. The ordinary includes the daily commute to work, taking out the trash and helping our children with homework. It includes our daily contact with co-workers, standing in line at the checkout counter and the many choices we make each day, large and small. Jesus tells us in John 14 that if we love him, the Father and he will come and make their home in us. One of his last words to the disciples was that he will be with us always. He is in us and with us if we choose to act on his presence. As a result, instead of cursing the person who cuts us off on our way to work, we bless him. We show patience to our children in helping them with their homework. We listen to a co-worker who wants to share a problem. We forbear in reacting negatively to an inattentive retail clerk. Ninety-nine percent of life is ordinary. If we are experiencing Jesus in the ordinary, we are experiencing the kingdom of God, which Jesus says is here and now. When a need or crisis hits we can then experience Jesus in the extraordinary as we pray with a sick friend for healing, bring reconciling words to a troubled relationship or love to a forgotten stranger – anticipating that God will act in and through us. This entry was posted in Christian life and tagged Experiencing God in the ordinary on July 28, 2015 by Bill Dalgetty. How do you share about Jesus? When Jesus sent out the seventy-two, he gave them explicit instructions how they were to stay with one host instead of many in order to build relationships and to serve their needs like healing the sick. As Christians, we are encouraged to witness and share about Jesus, and this we should surely do as God gives us the opportunity. But Jesus offers a guideline through his instructions to the seventy-two that emphasizes building relationships, loving people by serving their needs and then proclaiming the good news. 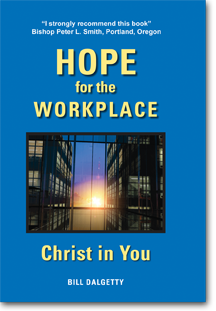 In Hope for the Workplace-Christ in You, there is the story of Diane who provides financial and insurance counseling to clients. One day when a client named Don came to seek advice about his 401K, he confided about injuring his back and struggling to find work that did not require heavy lifting. Diane mentioned that God wants to be with us in our struggles and asked if she could pray with him that God would give him guidance and find the right job. Diane then remembered that there was a security guard company next door that might have some openings, and asked Don if he would like her to introduce him to them. She made the introductions and they did have some openings, but to apply for the job, Don needed her assistance in downloading and completing some forms. It was now 6:30 p.m. and Don said, “You know, I have really found that Christians are nice people.” Diane asked, “Are you Christian? He said he was but that he didn’t go to church. Diane then shared about her faith and a ministry to which she belonged. She asked him to consider attending a weekend retreat the ministry was sponsoring. It is interesting that Diane was initially not trying to evangelize Don. Her first response was simply to listen to his concerns, act on them in introducing him to the security guard company and helping download and complete the application forms. Only when those needs were met and after Don made an observation about Christians did she share about her faith. This is a formula that missionaries have been following for centuries. Build relationships, love and serve needs, share the reason for your love – Jesus. This entry was posted in Evangelization and tagged Christian Witness on July 21, 2015 by Bill Dalgetty. Have you ever prayed and fasted for a family vacation? 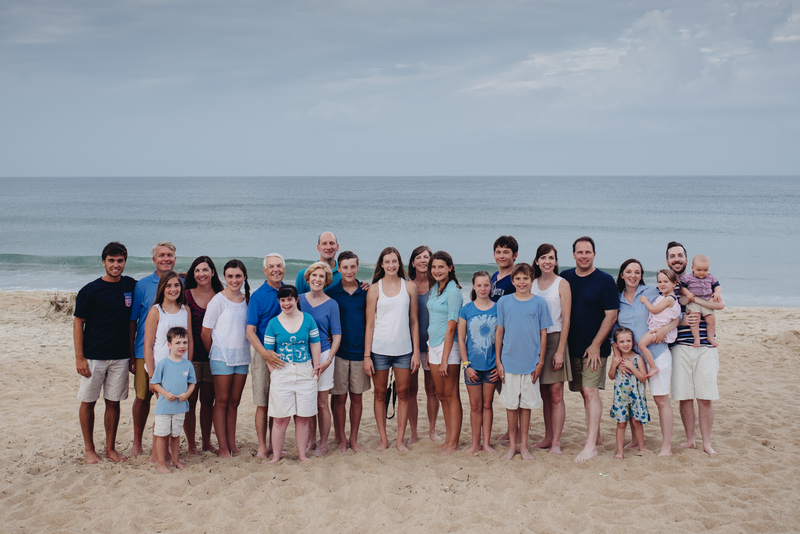 Last week our family which includes a single daughter, four married children, their spouses and thirteen grandchildren vacationed at a beach house on the Outer Banks of North Carolina. That’s 24 people under one roof, including nine teenagers and four little ones five and under, besides the 11 adults. In preparation for the week, my wife and I decided that we needed to pray for all who would be present, seeking God’s presence, blessing, peace, love and protection, which we reinforced with fasting. The blessings were amazing! While the potential for chaos was possible, there was no fussing or bickering among teens or adults. The teens, both siblings and cousins, hung out together on the beach, jumping waves, using the paddle board, building sand castles for the little ones, sunning themselves, taking walks, cooling off in the pool, or relaxing in the hot tub, walking into town for an ice cream cone, and videoing themselves for a video trailer commemorating their week. The married children also enjoyed hanging out with one another, catching up and sharing their lives. My wife and I just enjoyed taking it all in, engaging with adult children, spouses and grand- children alike. Each family took responsibility for an evening meal with the teens preparing the last dinner on Friday night. Each evening meal was preceded by 24 people standing in a circle holding hands to say grace, led by the father of the family preparing the meal and one of the teens on their night. Fathers and sons went deep sea fishing one day, while one mother organized an in-house spa day for the daughters. The men felt like the disciples when Jesus asked them to cast their nets on the other side of the boat. The catch included fifty-seven mahi-mahi, two mackerel and one 47 pound tuna. All returned safely home, with no injuries, mishaps or accidents. We were spared the presence of sharks which had attacked swimmers on Carolina beaches in prior weeks. The weather included sunny skies during the days and showers only at night. We asked, and God answered beyond all our expectations. In this day when God’s institution of marriage and the family seem to be under attack, we were blessed to experience and celebrate marriage and family the way we believe the creator of all things intended them to be. This entry was posted in Family Vacations and tagged Prayer and Fasting on July 13, 2015 by Bill Dalgetty. Have you ever become fearful about whether you can handle a new task or situation that appears formidable? Many Possibilities – The possibilities are many and varied — taking on a new job whose scope and responsibilities appear to exceed your skills and experience; facing the loss of employment; trying to restore a relationship that is broken; persuading a rebellious child to change his or her ways; providing ongoing care of a loved one; facing an illness involving suffering, disability or even death. All of these circumstances can give rise to fear and doubt. New Assignment Outside My Comfort Zone – After serving as an attorney for a large international oil company for most of my career, my last assignment involved overseeing our corporate policy and compliance of environmental, health and safety activities of the company worldwide. The entire staff was made up of engineers and technical people, taking me way out of my comfort zone. There were times when our staff was challenged when attempting to bring certain compliance issues to the attention of senior management and our Board of Directors. Although tempted by fear to back away from our findings, I prayed that the Lord would go before us. Interestingly, on every occasion when this happened the senior management of our company supported our findings and ordered changes in how things were being done. This entry was posted in Christian Encouragement and tagged Fear and Doubt on July 7, 2015 by Bill Dalgetty.